Three Games Sony Must Announced For PS4 In 2014: "GTA V, The Last of Us And Crash Bandicoot"
PlayStation 4 launch line-up was the best in the history of PlayStation consoles, and was enough for smooth sailing till the end of 2013. Year 2014 has just begun, and we already have some confirmed release of few hi-profile titles such as "next-Uncharted for PS4, The Order: 1886, Destiny, Metal Gear Solid V" and many others for PS4. Games that were available for PS4 at launch and the lot that Sony has in store for 2014, are certainly good, but PlayStation community is looking for some extra and unique magic i.e few last generation masterpiece titles for the next-gen console, so we decided to dig deeper and make a list of few last-gen games that might ignite new frenzy among PlayStation 4 owners. Time and again Rockstar Games have made it clear that they are concentrating only on Grand Theft Auto V for PS3 and Xbox 360, however till today numerous insider sources are claiming that GTA V for PS4 announcement is just around the corner. Recently an anonymous Amazon representative on Reddit made an startling announcement that GTA V for PS4 would be revealed in the first week of January 2014, whether it is TRUE or FAKE we will find out soon. But the fact of the matter states that GTA V for PS4 makes sense, releasing a new installment in GTA series after a long wait of FIVE years and at the end of the PS3 and Xbox 360 life-cycle won't be a sensible choice. PS4 user base is increasing dramatically, the numbers are already in millions and almost all of them want to play one of the best games in decade, GTA V on their PS4. Our insider source has told us to wait patiently for an official confirmation or denial of GTA V for PS4 from Rockstar Games at the end of January 2014. Last year it was rumored that Sony has bought Crash Bandicoot IP from Activision and are looking for some new talent to revive the series for the new console, Playstation 4. This was followed by Activision deleting all references of Crash Bandicoot from their official website and also closing a dedicated website of Crash Bandicoot managed by them. 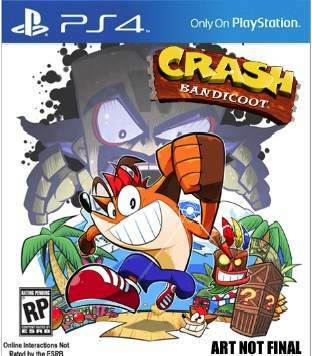 Immediately after this a wave of rage erupted on the internet and PlayStation fans demanded some sort of official words from Sony and finally Adam Boyes via Twitter quashed the rumor, stating Activision is the sole owner of Crash Bandicoot IP, any query related to new game in the series should be asked directly to them. Crash Bandicoot has tons of loyal fans, and so it would make a lot of sense for Activision to revisit the IP with a brand new idea for PS4. This masterpiece from Naughty Dog was announced immediately after the release of Uncharted 3 and at that time PS4 was nowhere in the picture. This game took the gaming world by storm when it launched in June 2013, critics described it as "Once in a lifetime experience". Naughty Dog was pleaded by fans to port The Last of Us to PS4 with upgraded graphics/visuals and few exclusive next-gen features. Initially Naughty Dog denied directly by stating there's no plan to bring The Last of Us to PS4, and they are working on to expand the storyline of the game with "Left Behind" DLC. The case of The Last of Us is pretty similar to that of GTA V, it also arrived at the end of PS3 life cycle, so ND and Sony should port the game to PS4 with some extra next-gen content and features. Demands for it is definitely high and its not a hectic task to achieve because we have a perfect example in front of us, Square Enix's Tomb Raider: Definitive Edition. Do you agree with the above list or not?, did we missed out any of the game you would like to see on PS4?, share it with us in the comment section below.